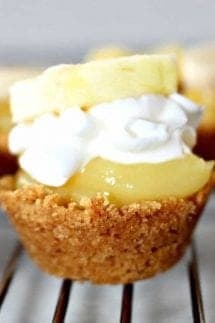 Banana Cream Pie Bites take your favorite dessert into individual servings. This easy dessert has the most delicious graham cracker crust and smooth and rich banana cream, topped with whipped cream and fresh bananas. Try to eat just one! Prepare banana cream pudding according to package directions - place in refrigerator until set. Bake for 5 minute or until top edges start to get golden brown. When cool, use a knife to loosen cups and "pop" out of muffin pan. Place pudding in a plastic sandwich bag and cut the bottom corner off - use this to fill the cups with the pudding (or you can just use a spoon to place a spoonful in the cup. Evenly distribute mixture to the mini muffin cups (makes about 18). Press along the bottom and sides to make a “cup”. Slice banana into small slices. Place some whipped topping on top of the pudding and place the banana on top! (if serving them later, fill the cups with the pudding and put in the refrigerator and put the whipped topping and banana on right before serving!